Jonathan Rogers was born at Plas-Onn, near Llangollen in Denbighshire, North Wales, and grew up speaking only Welsh. At 16 he moved to Liverpool where he worked at various jobs while perfecting his English. In May 1887, aged 22, armed with a legacy left to him by an aunt, Jonathan sailed for Montreal and crossed Canada on the first transcontinental train to Vancouver. Soon after he arrived, Jonathan attended the first public auction of parcels of CPR land within the newly created city. He bought four lots outside the area built at that time, although now located in the heart of downtown. He started work as a painter, and then became a construction contractor. The massive speculation that had accompanied the arrival of the railway in 1887 was soon halted when the economic realities of building a new city set in, coupled with a collapse in lumber prices south of the border. Jonathan Rogers held on to his land through this depression and in 1893 partnered with the Hunter Brothers (Samuel and Thomas) to build a 2-storey building on Columbia Street, near Powell Street known as the Commercial Block. In 1894 he announced that rather than leave the city (as many were preparing to do) he would be constructing a new building on Hastings Street. The first half of this development was designed by William Blackmore, who occupied it for his own offices once it was completed. The large windows used cast iron mullions to maximise the area of glazing. 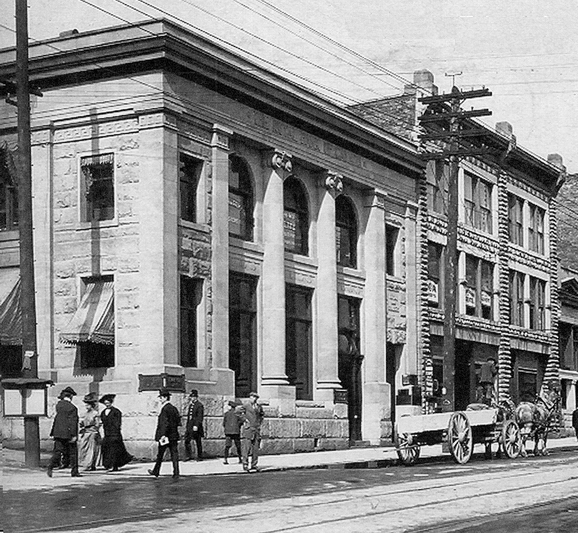 Four years later the gold rush in the Klondike ensured the city’s renewed growth, and Rogers engaged Parr and Fee to add a second half to the building. While almost identical to the first building, the window dimensions are just slightly different. Jonathan Rogers would almost certainly be unhappy with the current use of his buildings. These days they house the offices of the Marijuana Party and the Amsterdam Cafe. In 1916 Jonathan Rogers was the main organiser in Vancouver of the People’s Prohibition Association who successfully lobbied for the introduction of Prohibition in British Columbia (which lasted from 1917 to 1921). 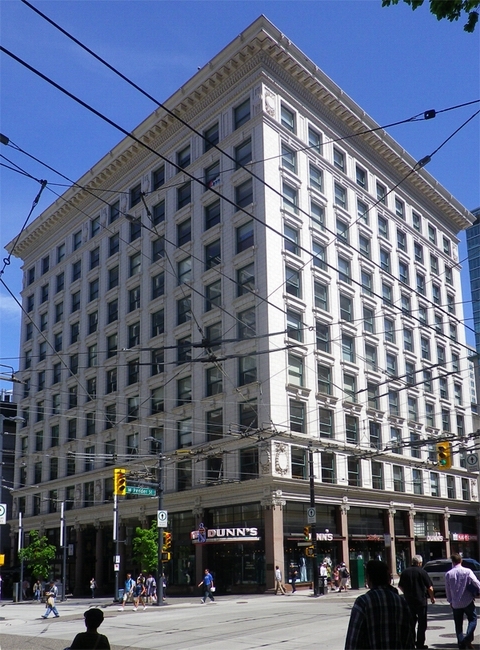 In 1898 Jonathan built the second Rogers Block on Hastings Street. He also must have acquired the adjacent corner site to the east, as in 1903 he hired Dalton and Eveleigh to design the Royal Bank of Canada, one of the earliest buildings in the city to use reinforced concrete, in this case for the foundations and vaults that were over half a metre thick. He had been similarly innovative on his block in 1898 – to ensure construction could complete by spring 1899 he erected a huge umbrella over the entire building site. The Royal Bank of Canada and Rogers Block not too long after they were built. Jonathan continued as a contractor and builder and soon became involved in all kinds of construction work – offices, manufacturing plants, hotels, banks, even an electricity-generating station in the city’s significant building and real-estate boom. Although aged 35, the 1901 census found him living in rooms as a lodger – the Street Directory seems to record him as a painter and decorator living on Homer Street. In 1902 he married Elisabeth, a girl from Oswestry, a town near his ancestral home in Wales. They lived close to Stanley Park at 2050 Nelson Street in a large, elegant house named Argoed, (Welsh for beside the wood). Elisabeth became heavily involved in civic life as one of the founders and early benefactors of the Vancouver Art Gallery and the Symphony Society. 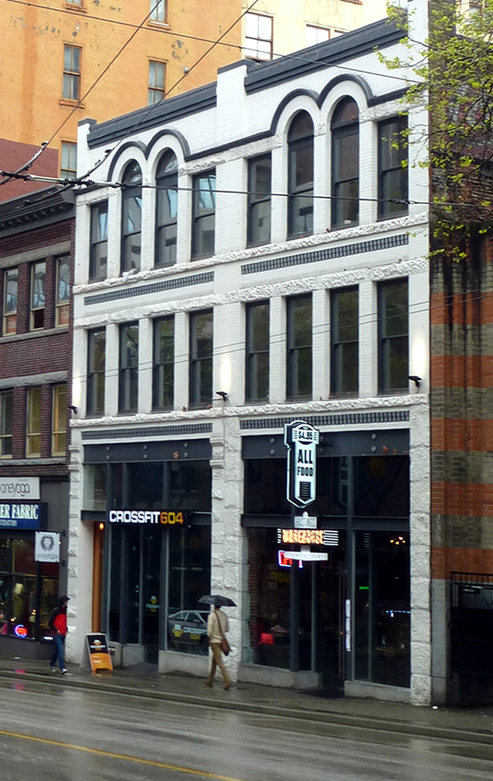 In 1901 Jonathan had built a building at 156 West Hastings, designed by Parr and Fee. In 1904 the adjacent site was developed by Elizabeth with a similarly designed building using William Blackmore & Son as architect. (In 1940 the building was altered so both halves took on Blackmore’s design). 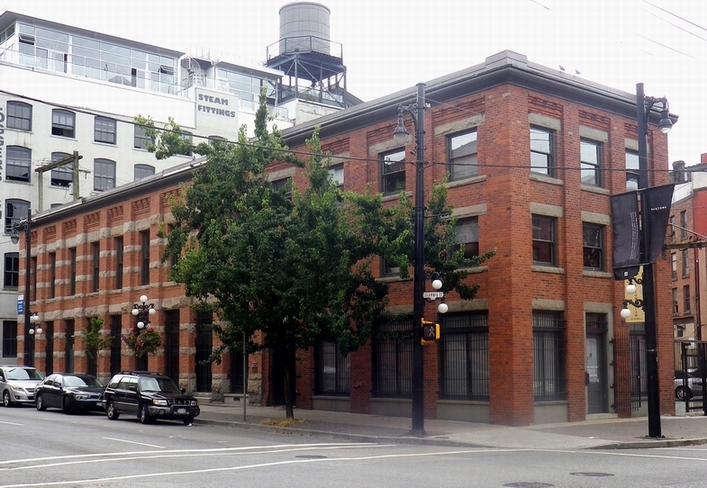 In 1907 Jonathan built a single storey (to the street) but 4 storey to the lane warehouse on Beatty Street. He sold it fairly quickly, as Robert Welsh owned it and added two additional floors in 1912. Seeking to join in the new boom as a significant developer rather than just building modest buildings or other people’s projects, Jonathan turned to a Seattle firm of architects, Gould and Champney to design one of the most expensive buildings the city had seen. 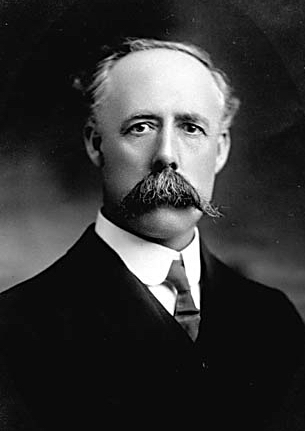 By the outbreak of the First World War in 1914 Jonathan Rogers was a very wealthy man and a prominent public figure in Vancouver. He was elected an Alderman twice, served for 26 years on the Parks Board, 9 of them as Chairman, and was Chairman of the Board of Trade as well as being involved in a variety of charitable enterprises. 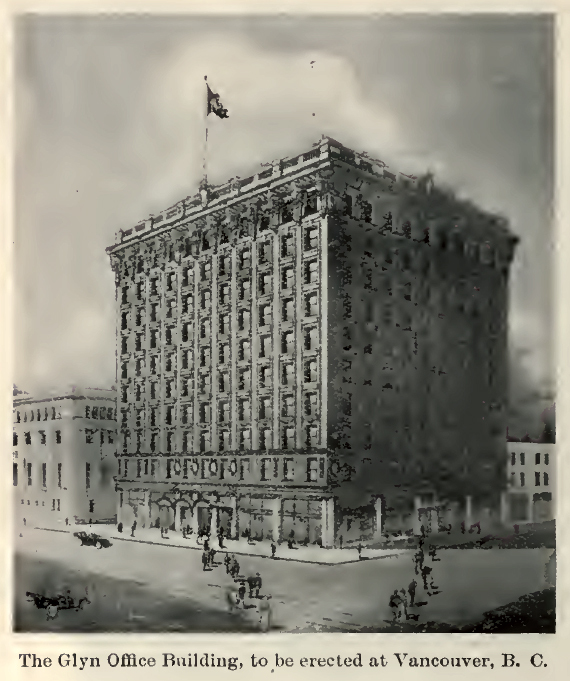 Rogers sold the 1912 building in September of 1927 to General F. A. ‘One Arm’ Sutton for a sum “exceeding $1 million” – the largest real estate transaction in the city to that time. Around 1940 he bought it back – although by then his wife Elizabeth was managing their interests. Jonathan Rogers died in 1945 and left what at that time was a very large sum of money, a quarter of a million dollars, to various causes in Vancouver. The largest single bequest of $100,000 was given to the City of Vancouver to create a neighbourhood park in a poorer part of the city. After several delays, a park bearing the name Jonathan Rogers Park was finally opened in 1958 on 8th Avenue in Mount Pleasant. 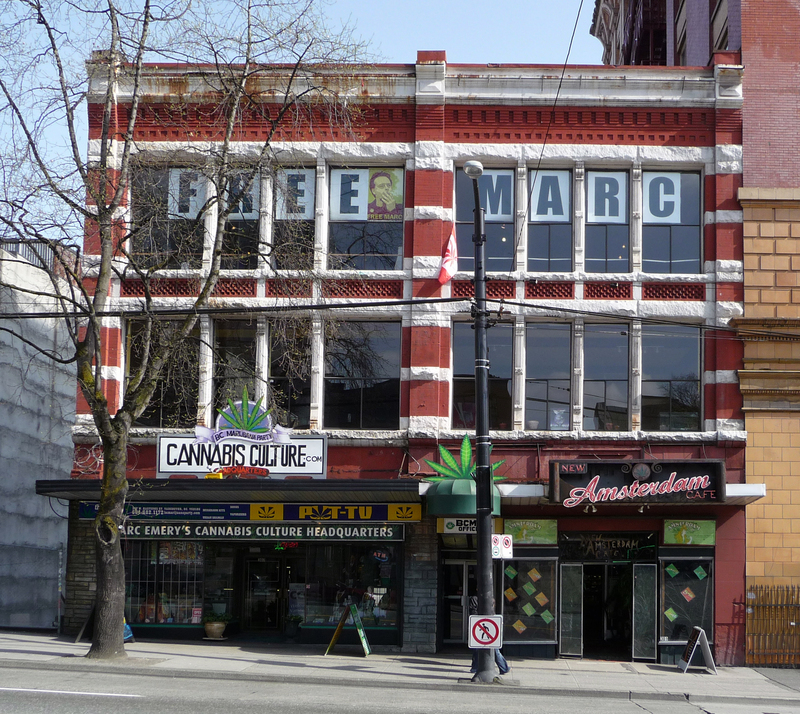 This entry was posted in Downtown and tagged 1894, 1898, 1912, Downtown, Gould and Champney, Granville Street, Hastings Street, Jonathan Rogers, office, Rogers Block, Vancouver, William Blackmore by ChangingCity. Bookmark the permalink. interesting to me .Jonathon Rogers was my great uncle .i lived at plas onn when i was a child.